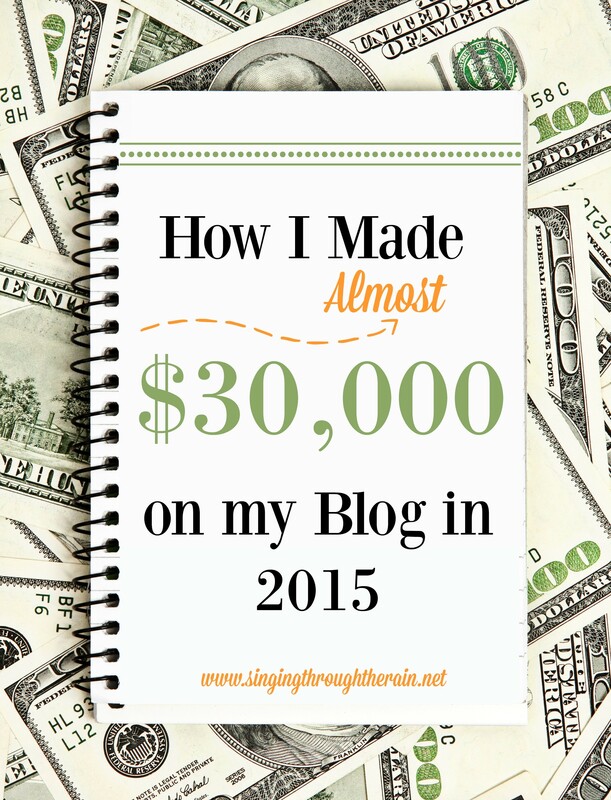 Today’s blog income report comes from Kathryn at SingingThroughTheRain. We have known Kathryn for many years, in the blogosphere, and we are excited to have her sharing this with us today! Have any questions? Leave a comment below or email me: singingthroughtherain(at)gmail.com. Great job! Sometimes, I will read someone’s stats, and they are so high, that it seems unattainable. Your numbers give me hope! Thank you! It IS do-able, you just have to work hard. Good luck! Great job and thanks for specific details. Young bloggers greatly appreciate it when it’s broken down in small goals like that. This makes it seem like a real job. $30k a year is fantastic and you’ll only be moving up from that for 2016! Thanks for sharing! Hello! How many page views do you normally have each month? No problem! I appreciate it too! I like to study other’s income reports, but sometimes it’s hard when it’s not broken down enough. PadSquad sounds great! Does PadSquad only accept bloggers with a certain amount of page views? Yes, exactly! This is the first year I made this much. Can’t wait to see where this goes in 2016! In 2015, I averaged 400,000 pageviews per month. Glad to help! I don’t believe they require a certain amount of pageviews, but not 100% sure. This is awesome, thank you so much. Can I ask how you publicise your blog services? Do you just have that page on your site, or do you draw traffic to it in other ways? I’m not sure I understand your question. Can you ask again? Thank you so much for the ideas and inspiration! I went to the PadSquad link but I don’t understand how I should apply haha newbie here! Thank you for all of this information. I’ve been blogging for several years, and I’m finally taking seriously the idea of making money from it. I’ve stuck to Google AdSense prior to the past couple months, but I realize I need to branch out. I’m definitely going to check out PadSquad, along with a few of the other suggestions. Great work on blogging. I’ve usually relied on AdSense and Amazon. I never realized there were so many others. Thanks for the tip. Here’s the direct link to sign up! It’s a Google Document form. Thanks for breaking it down. I am just starting and I am trying to learn how to monetize my blog so this helps a ton! Thank you so much for this detailed report! I’m going to check out some of these sources for sure. Congrats on your success! !